Since the late 1990s, WWT and WWT Consulting have pioneered the use of aerial surveys in the UK to count waterbirds at sea. These surveys were the first comprehensive ornithological assessment of the UK’s inshore waters and resulted in several major ornithological discoveries, including the identification of a number of important areas for seaducks and other waterbirds, some of which are now designated as marine Special Protection Areas (SPAs). They also helped to ensure the appropriate siting of offshore wind farms. Among the birds surveyed as part of this work, seaducks are of particular interest to WWT. Despite some significant improvements in our understanding of their lives over the past 15-20 years, most remain among the least known of our waterbirds. They are also of increasing conservation concern – large declines in several species have been found recently at wintering strongholds in northwest Europe, particularly the Baltic Sea. 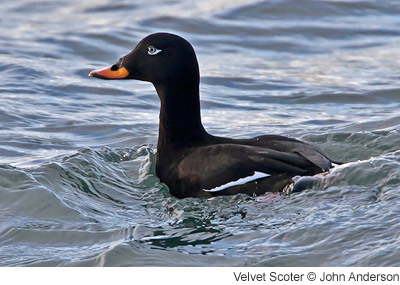 As a result, since 2012 two species have been listed as globally Vulnerable, the Velvet Scoter and the Long-tailed Duck. More on the worrying declines in seaducks can be found here. Most seaducks come to the UK in the winter, from more northerly breeding areas including Iceland, Scandinavia and Russia. They winter around our coasts, at some sites far from shore, favouring relatively shallow areas where they dive to predominantly feed on bivalves, though Red-breasted Merganser is a fish eater. Only Common Eider is a wholly marine species; all of the others also frequent freshwater habitats for at least part of the year (usually when breeding but sometimes during winter too). Three species breed regularly in the UK: the Common Eider is fairly widespread around the coasts of northern Britain and Northern Ireland, the Common Scoter is at the southern edge of its breeding range in Britain and just a small number of pairs breed in Scotland, and the Red-breasted Merganser is found in low densities around the coast of northern Britain, but also inland along rivers. WWT and WWT Consulting have been working to help improve our understanding of the status of seaduck populations in the UK since the early 1990s. A review by Jeff Kirby and others (Kirby et al. 1993) set the scene for this work, with early efforts focussing on the known internationally important concentration of Common Scoter at Carmarthen Bay. This then gathered momentum following the Sea Empress oil spill, when WWT undertook further aerial surveys of Carmarthen Bay to assess the impact of the oil spill on the wintering scoters and identify the most important areas being used (e.g. Stewart et al. 1997, Cranswick et al. 1998). The data gathered at this time resulted in Carmarthen Bay being notified, in 2003, as the UK’s first marine SPA for its wintering aggregation of Common Scoter. Following those pioneering aerial surveys, the need for surveys quickly increased, particularly because the rapidly developing offshore wind energy industry needed data to underpin environmental impact assessments. As a result, the All Wales Common Scoter Survey – an integrated programme of land-based and aerial surveys that began in 2000/01, primarily as a partnership between WWT and the then Countryside Council for Wales (now Natural Resources Wales) was developed to meet these survey needs and coordinate effort as much as possible. The other major need for aerial surveys of inshore waters was to identify a comprehensive suite of marine SPAs and these were largely undertaken by WWT/WWT Consulting (mainly in England and Wales, but also covering a few sites in Scotland) and JNCC (who undertook the majority of surveys in Scotland). A more detailed summary of the development of aerial surveys can be found in Smith et al. (2007). a huge aggregation of up to 79,000 Common Scoter in Liverpool Bay, including 55,000 around Shell Flat (a shallow sandbank offshore of Blackpool), making it the most important site for this species in the UK. Combined with the large number of Red-throated Diver also found there, three proposed wind farms were revised and Liverpool Bay is now a marine SPA for both species. the discovery of a large number of Red-throated Diver in the Thames Estuary, which is also now designated as a SPA, and which led to a significant revision of the British population estimate (see O’Brien et al. 2008). Nowadays, these surveys are largely undertaken commercially by a number of different companies using high resolution cameras instead of human observers. WWT’s monitoring team is now focussing on making sure this and other relevant information is available for future seaduck conservation activities, and that key gaps in monitoring coverage are addressed. We are therefore working with partners to develop a comprehensive inventory of information sources and an online resource centre, and to support studies and surveys that address priority information needs for the UK’s seaducks. This will support the European Seaduck Work Group – a group of experts convened under the Duck Specialist Group that is coordinating and facilitating seaduck monitoring, research, conservation and management in Europe. What other information is available on seaducks in the UK? plus, many other local surveys and species-specific research programmes, which will be listed here in due course. Information on breeding seaducks is limited. The national Atlases, led by BTO and undertaken approximately every 20 years, most recently in 2007-11, provide us with good information on distribution, but there are only limited surveys to estimate numbers and trends, or monitor demography. As Common Scoter is a conservation priority in the UK, because of its small and declining breeding population, detailed monitoring and research is undertaken by WWT in collaboration with RSPB and others. We have undertaken two national surveys to date, in 1997 (see Underhill et al. 1998) and 2007 (see Rare Breeding Birds Panel report), and work closely with RSPB to monitor key sites annually. Coquet Island, Northumberland – led by John Coulson (e.g. Coulson 2010). Clyde Estuary, Argyll/Ayrshire – led by Chris Waltho (e.g. Waltho 2004). Ythan Estuary, Aberdeenshire – led by various people at Aberdeen University and Scottish Natural Heritage. These studies monitor trends in numbers, but also demographic rates such as breeding success and annual survival. A number of these are collecting data that feed into the national Retrapping Adults for Survival programme and Nest Record Scheme, both carried out by the BTO. For Red-breasted Merganser, no recent information is available – the population estimate dates back to 1988 and there is no trend information with which to extrapolate to the present. Nothing is known about their annual breeding success or survival. Little is also known about the origins and movements of our wintering seaducks, particularly the northerly breeding scoters and Long-tailed Duck, as well as Red-breasted Merganser, but there also remain questions about the delineation of Common Eider and Greater Scaup populations. This lack of knowledge limits our understanding of migratory routes, and more localised site use between and within winters. A comprehensive programme of coordinated (nationally and internationally) counting, both in the winter and, where relevant, the breeding season. Mapping of migratory flyways and local movements using e.g. satellite telemetry, stable isotope, and genetic techniques. Estimates of annual breeding success and survival, through more regular surveys and capture-recapture studies. Coordinated management of data and knowledge. In collaboration with the African-Eurasian Waterbird Monitoring Partnership‘s (AEWMP) Marine Waterbird Working Group and national partners such as JNCC and the BTO, WWT is working to help develop this. Cranswick, P.A., B. Stewart, I. Bullock, R. Haycock & B. Hughes. 1998. Common Scoter monitoring in Carmarthen Bay following the Sea Empress oil spill: April 1997 to March 1998. CCW Sea Empress Contract Report 320, CCW, Bangor. Coulson, J.C. 2010. A long‐term study of the population dynamics of Common Eiders Somateria mollissima: why do several parameters fluctuate markedly? Bird Study 57: 1-18. Kirby, J.S., R.J. Evans & A.D. Fox. 1993. Wintering seaducks in Britain and Ireland: populations, threats, conservation and research priorities. Aquatic Conservation: Marine and Freshwater Ecosystems 3: 105-137. O’Brien, S.H., L.J. Wilson, A. Webb & P.A. Cranswick. 2008. Revised estimate of numbers of wintering Red-throated Divers Gavia stellata in Great Britain. Bird Study 55: 152–160. Smith, L.E., C. Hall, P.A. Cranswick, A.N. Banks, W.G. Sanderson & S. Whitehead. 2007. The status of Common Scoter Melanitta nigra in Welsh waters and Liverpool Bay, 2001–2006. Welsh Birds 5: 4–28. Stewart, B., B. Hughes, I. Bullock & R. Haycock. 1997. Common Scoter Melanitta nigra monitoring in Carmarthen Bay following the Sea Empress oil spill. WWT Wetlands Advisory Service Report to CCW. Underhill, M.C., T. Gittings, D.A. Callaghan, B. Hughes, J.S. Kirby & S. Delany. 1998. Status and distribution of breeding Common Scoters Melanitta nigra nigra in Britain and Ireland in 1995. Bird Study 45: 146-156.